How Does A Snap Cutter Work? The Kwik-Snap 2500 Production Cast Iron Pipe Cutter is a powerful portable high volume soil pipe cutter for cast iron pipe. With its 3.5 second cutting cycle time from the electric hydraulic power, you can cut more pipe faster to get the job done quickly. 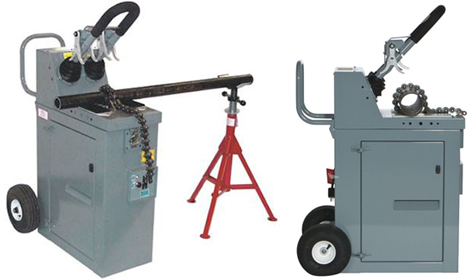 It has a capacity of 1-1/2" to 6.00" OD pipe and its unique chain design cuts pipe fast, thus eliminating the need to reset for each cut on the same size pipe. It is quiet and reliable and easy to use. Overall dimensions: 32" x 20" x 50"
Replacement Cutter Chain... 5 lbs.